Why not replace your cardio sessions with a rapid fire exercises session that actually supports muscle growth & fat loss. Cardiovascular exercise is not the only way... Try the following for success in less time! "Cardiovascular exercise is not the only way to get your heart pumping." One of the greatest misconceptions I encounter from new clients is the assumption that morning cardio is absolutely necessary to support fat loss. Following a switch from endless steady state cardio to short burst or interval training clients shed fat at a much faster rate while spending less time in the gym. Why not replace your cardio sessions with a rapid fire exercises session that actually supports muscle growth and fat loss. Cardiovascular exercise is not the only way to get your heart pumping and fat burning engine racing; you can achieve the same benefits from fast paced exercise sessions using any number of body weight resistance and callisthenic movements. Yes, training first thing in the a.m. on an empty stomach does create an opportunity for accelerated fat loss due to the depletion of fuel sources during the overnight fast; however these conditions also leave hard earned muscle exposed to destruction. The ability to run detailed exercise, nutrition and supplementation experiments in Dr. Serrano&apos;s office provides a huge advantage. Our latest creation addresses a majority of the success barriers faced by the tens of thousands of trainees I am able to survey over a year. The two most common are a lack of time and energy which can be solved with the implementation of short burst (SB) workouts. These are 15-20 minute intense exercise sessions done with minimal equipment to maximize metabolism, energy and mental sharpness. Exercise in this fashion not only burns calories, but also accelerates metabolism for many hours following. We have successfully designed dozens of SB workout programs covering all body parts and skill levels. "I have been a morning cardio addict for years thinking if I did not do it I would blow up like a blimp. The SB sessions have replaced the a.m. cardio completely and I am leaner than ever before (7%) with a lean muscle mass 8 lbs higher than my previous best. This is best addition to my scheme in 10 years!" - Mike L. T.
Logically increasing the frequency of quality exercise sessions will burn more fat; however preventing overtraining must be considered which is why the extra workouts are short yet intense. The goal is not to tack on time to your training commitments, rather to increase quality and ultimately production, after all you cannot sprint forever. An example of a SB session include alternating sets of 5 chin ups and weighted push ups for a total of 40 reps each in a total of 20 minutes. 5 push ups seems easy, but implementing a controlled tempo and extra loading combined with minimal rest turns this into a fat blasting party. You will be invigorated with energy and metabolism will race - a much better option than reading the funny papers in the morning. Any motivated person can designate 20 minutes a day to train at home first thing in the a.m. or at another time if your goals are genuinely important. Start exercising and your daily energy levels will improve quickly! Some clients only have time for SB workouts and see great success while more aggressive individuals will perform additional weight training sessions at a different time. 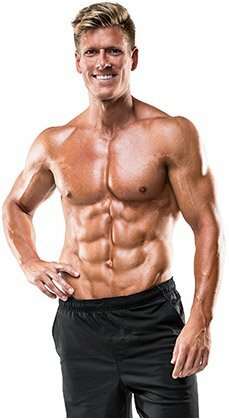 The client test group (11 males 28-41 years of age) using SB workouts 4 times per week combined with a traditional Rapid Rip weight training program later in the day averaged a 3.5% body fat loss during the first 45 days, all started under 16% body fat to begin with and made use of customized nutrition and supplementation plans. None spent more than 4 hours exercising in a 7-day period. Perform each exercise as a superset: Perform 40 reps of each within 20 minutes using a controlled speed of movement to maximize muscle recruitment. You have read thousands of articles discussing adding weight, reps, sets, leaps, bounds, etc., but have you ever considered doing the same or more work in gradually less time (which is also a form of progression)? This mechanism is called density, the forgotten factor of improvement closely associated with muscle growth, fat loss and an anabolic hormonal explosion of testosterone and growth hormone. Diminishing rest increase the production of Lactic Acid responsible for that burning sensation nature so happily provides to remind you of your hard work. This is a powerful precursor to growth hormone which is a potent fat BURNING hormone. Why not try doing in the natural way? Cut rest periods by 10 sec each week without reducing weight. For you muscle hungry animals - try the first SB training routine above in the morning and this Rapid Rip routine that afternoon for your personal fat burning breakthrough! Going For The Ever Elusive Six Pack? I wish I had $100 for every time someone asked me how to get a six pack after years of trying - over the past two days alone I would have $1,000. Here is something we know for sure - your current strategy is not working. Time for strategic change or you can expect the same lousy results with your current methods. I am going to address this from a scientific perspective: Training and nutrition elements must be considered; to the surprise of many diet is much more important as there is more to fat loss or muscle gain than the overly simplified calories in vs. calories out equation. Eat 2,500 calories worth of potato chips and get the same results as 2,500 calories of clean food? No way! Hormones run the show and according to 15 years of hard research and great patient results I can tell you for sure that the same plan does not work for everyone. However those who can naturally manipulate their hormones with diet, supplementation and exercise are successful 100% of the time. "Do short burst abdominal routines once per week and you will have a great six pack quickly." The SB training is awesome, I do it myself when work piles up as I am limited on time - it makes my mind sharp and I stay in great shape. The SB abdominal routines are awesome. Do it once per week and you will have a great six pack quickly, assuming you are able to achieve a low body fat percentage. The most critical element is determining how your hormones and metabolism react to certain food sources, timing and combinations based on a series of experiments I conduct with my patients. At a recent seminar I was mugged by attendees wanting to know how many calories to consume, macronutrient&apos;s, carb cycling, etc. Yes, all of these factors need to be set up; the details must all be ironed out based on individual needs. Furthermore changing factors at the right time is critical to your success. Why gamble with your results by going it alone with program design when you can ensure success with a customized plan? Your individual traits play a vital role in program design including age, gender, genetic background, stress levels, prior nutrition habits and more. For example should a person who works all day doing manual labor eat the same amount as someone behind a desk even if they weigh the same and have similar goals? Heck no! Small refinements can be the difference between slow progress and staggering fat loss! Explaining the methods would take up too much space, but needless to say you better find help from an expert if you are looking for both rapid and permanent results. Insulin is a fat storage hormone while other, not so welcome, hormones activate fat accumulation receptors supporting fat deposition specifically on the mid-section for men and upper legs for women. The typical American Diet combined with growing rates of stress is a recipe for physique disaster. I take the fitness mission of every client as a personal challenge that I must help them win by providing the customized tools necessary to get the job done! Building a mile-wide back takes effort and a smart plan. Superset these two back exercises for a monster pump!